Kick off your summer by learning about great places to hike in the Chicago region. On Wednesday, May 5, 2010, I’ll be giving a presentation at the Warrenville Public Library. While showing photographs, I’ll be highlighting some of the lovely natural areas in Chicago’s west suburbs and beyond. Whether you’re looking for rivers, prairie, thick woods, long trails, or short, I’ll cover a variety of great local places to stretch your legs. The presentation starts at 7 p.m. Bring your questions. I’ll have copies of 60 Hikes with 60 Miles: Chicago to sign and sell, as well as copies of my just-published books, Road Biking Illinois: A Guide to the State’s Best Bike Rides and Camping Illinois: A Guide to State’s Best Campgrounds. The library is located just off Butterfield Road in Warrenville. Anyone who’s passed within 100 feet of me during the past year knows that I have four new guidebooks that will be released this coming spring. Three of the books—Best Illinois Rail Trails, Illinois Road Biking, and Camping Illinois—required many months of research and writing. While researching the books, I camped for several months and I drove and bicycled for a few thousand miles. I explored Illinois from head to toe, visiting nearly every major park and most of the state’s historic attractions. I explored the rocky cliffs in the Shawnee National Forest and I cycled along the banks of the state’s big rivers. I traveled for many miles on old farm roads where the only sound was the twittering of sparrows. All in all, it’s been the best job I’ve ever had. I love the process of exploring new places, gathering information, and then shaping the details into something that is eminently useful and fun to read. While this process gives me a special thrill, even more satisfying is the next step—getting the books into the hands of readers. The other book to be released this spring is a new, shorter version of my book, 60 Hikes within 60 Miles: Chicago. It’s called Easy Hikes Close to Home: Chicago and it’s geared specifically toward newbie hikers who are interested in less strenuous local hikes. Like the other books, I’m eager to see this book put to good use. Enticing new people to explore local trails is an exciting prospect. All four books are now available for pre-order on Amazon.com. Titles listed below link to a description of each book, its full table of contents, and a page for pre-ordering. During the past week, I’ve had the pleasure of crossing paths with several people who have committed themselves to working their way through the hikes in my book, 60 Hikes within 60 Miles: Chicago. I met a married couple at a party who said they have already completed 20 hikes in the book. I loved hearing about their explorations and their descriptions of the places they enjoyed the most. They told me they often hike more than one trail in a single day by choosing hiking destinations that are close together. We had plenty to talk about because they had camped and hiked in the Shawnee National Forest, a place where I’ve spent time, too (it also happens to be the one of the best areas for hiking and camping in Illinois). In addition to meeting this friendly couple at a party, I recently received the above photo and following e-mail letter from John Tarzynski, who lives in St. Charles. My name is John Tarzynski. First of all, I have to compliment you about your book. Wow! It’s concise, accurate and fun to read. Your descriptions of the trails and how to navigate them are dead on, and you have great suggestions for additional activities. I’m new to hiking, biking, camping and backpacking this year but I’m getting out there, doing it all and love every minute of it. I purchased your book 60 Hikes Within 60 Miles (2nd Edition) back in March at the REI in Schaumburg to assist and enhance my hiking experience, and it’s done just that. So far this year I have been on three of the trails (Silver Springs Trail, Fullersburg Woods and Danada). I enjoyed them so much I went back to a couple of them with my wife and two daughters. They, too, very much enjoyed the hikes (and horses at Danada!). I’m planning to hit one of the Palos/Sag trails this Sunday afternoon since I’ll be in the area for band rehearsal (I play drums). So the timing is good and the weather forecast looks great. I have to thank you again for such a great book. You have not only provided a great resource for Chicagoans, but you have provided me with a goal. That goal is to hike every trail in the book. No special time frame, it’s just something I’ve set out to do because there is so much to see and experience out there in nature, family, solitude and just plain fun. Hiking has really helped me decompress from the daily stresses of life. I wanted take some time to write you, as I imagine most people don’t take the time to communicate their appreciation for your hard work. Thanks again and hope to meet you out on the trails someday! P.S. Nice website, too. I have subscribed to your Prairie Fever newsletter. 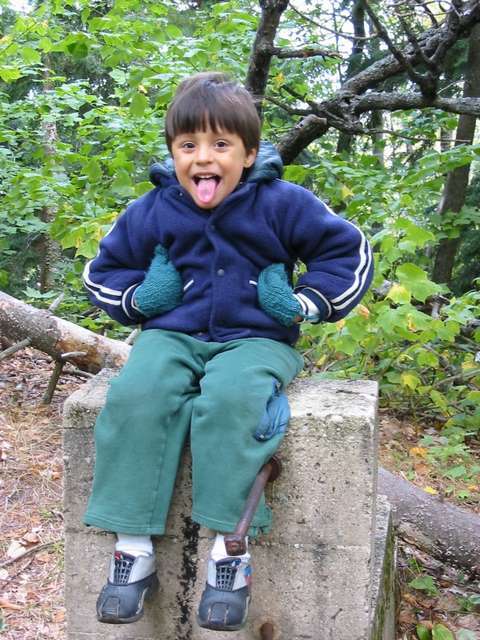 Also, I have attached a photo to share with you from my very first hike ever, which was at Silver Springs Trail on April 17, 2009. It was early evening and I was standing on the wooden dock directly above the spring. It reminded of the Yellow Brick Road…only in green! Hope you enjoy it. I was utterly thrilled to receive John’s letter and hear about his newfound passion. And of course, I was excited about his goal of hiking all the trails in the book. I was especially pleased to hear that John was sharing his love for hiking close to home with his family. I asked him to keep me posted about his hikes as he works his way through the book. Thanks again, John. If any hikers want to share their experiences on local trails, I’d love to hear from you. You can add comments and information about individual hikes in the photos section. During June and July when ticks are most active in Illinois, be sure to check your exposed skin frequently while out hiking. At this time of year, I find ticks most frequently appear inside the top edge of my ankle-length socks. I’ve also found them, ahem, inside the waistband of my shorts. I’m told that ticks appear often in these places because they need a backstop to drill into the skin. The good news is that these these little vampires have to be attached for at least four hours before they can transmit an illness such as Lyme disease or Rocky Mountain spotted fever. The Illinois Department of Public Health has some good information on preventing tick bites and what to do if a tick is attached to you or your pet. This article from the Bollingbrook Sun mentions that Will County had 16 confirmed cases of Lyme disease in 2006. 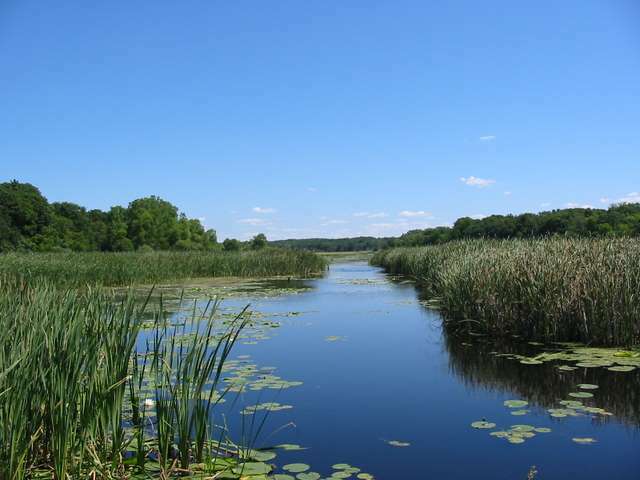 In observance of National Trails Day on June 6, the trail system at Moraine Hills State Park in McHenry County was designated a National Recreation Trail. 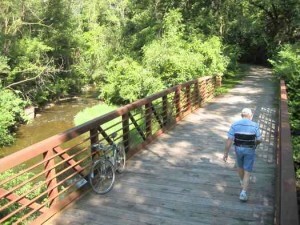 The Moraine Hills trail system is one of only eight Illinois trails that have been designated as National Recreation Trails. Two of these trails are in the Chicago area: the Danada-Herrick Lake Trail and the Springbrook Prairie Trail. According to American Trails, the National Recreation Trail designation is given to “exemplary trails of local and regional significance.” I’d say that’s a concise description of the trails at Moraine Hills. To learn more about these trails, read the chapter from my book that focuses on Moraine Hills State Park. Also, take a look at some of my photos of Moraine Hills. It’s a stroke of luck that one of the best hiking destinations in the Chicago region is easily reached on a commuter train. A ride from downtown Chicago aboard the South Shore Line will take you to Indiana Dunes State Park. From Millenium Station downtown, catch the train to the Duneland Park Station, and then walk one mile north into the park. It’s a perfect car-free getaway with about 10 miles of excellent hiking trails and several miles of sandy beach perfect for picnicking. Here’s a new slideshow focusing on the often stunning trails within the park. Thanks to my gifted friend, Doublebrightness, for providing the music. While picnicking on the beach, consider bringing some extra food in case you encounter Bigfoot (I understand that it likes sliders). Here’s a video clip someone posted on YouTube of a big hairy visitor at the Dunes. There’s no arguing with the benefits of taking kids on a hike. It allows the family to spend time together, keep fit, and experience the pleasure of exploring the natural world. When looking for a Chicago-area hiking spot to bring the family, keep in mind that some destinations will be better than others. A visitors center with engaging nature exhibits is always a plus for kids. Generally, younger children will prefer a shorter hike through a gentle landscape. Avoid places that are overly busy. During summer weekends, Chicago’s Lakeshore Path or Waterfall Glen Forest Preserve in DuPage County can be overwhelming, not to mention dangerous, for a small child on foot. Build a child’s interest by asking him or her to help choose the destination. Consider your own preferences, too. If parents are enthusiastic, it will likely rub off on the kids. Start hiking early and quit before their energy goes on a sharp decline. Make sure you match the kids’ interests and hiking ability with the right trail and the length of time hiking. Take a rest break every half hour or so. Play hide and seek by having the kids run ahead on the trail. After everyone walks by, the kids can surprise the family from behind. Ask kids to find items along the trail: a purple flower, a red rock, or a type of leaf. Consider bringing items such as binoculars, a magnifying glass, and a camera. Parents may find it useful to check out my book, 60 Hikes within 60 Miles: Chicago. It lists the top kid-friendly hiking destinations in the Chicago area and describes each hike in detail. The beauty of walking is its simplicity. It costs nothing, it’s always available, and, of course, it allows you to get from one place to another. Some people say walking inspires thought and helps them sort through life’s difficulties. If you’ve considered embarking on a new walking routine, you may want to do a bit of preliminary research in order to answer a few questions. Should you use a pedometer? What’s the best walking technique? How often should you walk? All these questions and others are succinctly addressed in a useful little bochure recently released by the American College of Sports Medicine. The organization has a great collection of free brochures addressing an array of excercise and health-related topics. In related news, a new survey ranks Chicago fifth best city in the nation for walking. Take a look at a couple slide shows I recently created highlighting hiking destinations featured in 60 Hikes within 60 Miles: Chicago. Prairie Fever is powered by	WordPress 3.5.1 and delivered to you in 0.197 seconds using 29 queries.